Exploring Bhutan, you imagine yourself catapulted hundreds of years back. This is enhanced by its' people, hardly influenced by Western mass consumption and lifestyle. Instead they still wear their selfwoven traditional outfits, leading a calm, simple and peaceful life. The first records of people settling in Bhutan go back 14.000 years ago. It is very wel possible though that Bhutan was already inhabited by scattered clusters of tribes. The Drukpa are Bhutan’s indigenous population. They can be divided into three main ethnic groups: the Sharchops, Ngalops and Lhotsampas. The Sharchop are believed to be Bhutan’s original inhabitants, living predominantly in Eastern Bhutan. Their roots lie in North Burma and Northeast India. Bhutan’s second tribe are the Ngalop. Importers of Buddhism to the kingdom, they migrated in the late 19th century from the Tibetan plains. You find them mainly in Western Bhutan. In the early 20th century, the Lhotshampa nestled in the southern plains of Bhutan, looking for agricultural land and work. They are of Nepalese origin and you’ll recognise them by their ‘topi’, a very specific headgear. This minority group was so heavily discriminated in the late 1980’s, that in 1990 they massively fled to Nepal. Nowadays they still can’t return back to Bhutan and live mostly in Nepalese refugee camps of the United Nations. 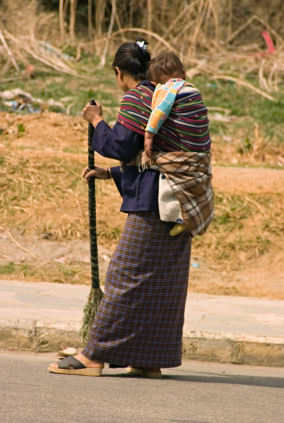 Bhutan is a relatively egalitarian society where women enjoy equal rights with men in every respect. Because the kingdom is gender balanced, there never was any need for the upliftment of woman. They are actively involved in all ranges of Bhutans socio-economic development. The kingdom also never had a rigid class system. People's rank of birth doesn’t influence their opportunities on the social and educational ladder. One of Bhutan’s major ‘secrets’ is the exact number of people living there. The United Nations have estimated that Bhutan is inhabited by about 2.1 million people, but there are also rates of no more than 810.000 inhabitants. However, Bhutan is one of the countries in the world with the least dense population, with 79% of the people living in rural areas. More than 90% of the people are selfproviding and spread across the country in sparsely populated villages. It was only in the mid 1900’s - when roads were built to connect the different regions of the country - that ethnic groups started to mingle.